Mary Jacqueline Lualdi of Armada, MI passed away peacefully on Wednesday, December 26, 2018 at the age of 79. Mary (Jackie) was born October 13, 1939 in Fargo, ND to the late Connie and Francis (Ryan) Morris. She married the late Louis on August 22, 1959 at St. Jude Catholic Church in Detroit, MI. Jackie worked as a secretary at Armada High School for 23 years until her retirement in 1998. 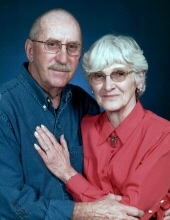 Lou and Jackie loved to travel in their RV and often visited Arizonia for the winter months until his passing on March 4, 2013. She also enjoyed walking with her friends, zumba gold, gardening, and bird watching. Jackie is survived by her children; Victoria (Michael) Berlin of Capac, Douglas (Dorothy) Lualdi of Bellaire, Donna (Daniel) Bertossi of Memphis and Leslie (Kevin) Blissett of Richmond; grandchildren Jessica, David, Emily, Austin, Joshua and Faith; and great-grandchildren Sara and Nathaniel. In lieu of flowers, memorial donations can be made to St. Jude’s Childrens Hospital.